Whoo hooo! Wickedly Spirited is out today! This is the third novella in the BABA YAGA SERIES, and falls between the events of Dangerously Charming (the first Rider book) and Dangerously Divine (the second Rider book, out November 28th). It features the teen Jazz we first met in the story of the third Baba Yaga in Wickedly Powerful. I'm going to be traveling for a chunk of the time leading up to release day for the newest Baba Yaga novella, Wickedly Spirited (have I mentioned it is only $1.99? ), so I thought I'd leave something here to entertain you. And because I know some folks are sad that the novella isn't available in print (it's too short for the publishers to do that), I'm going to do a giveaway for a Kindle Fire 7 Tablet! And a cute kitty that looks a bit like Koshka, the Norwegian Forest cat who is featured in the novella. Things have been a little crazy here (what's new, I know) and I realized I never put up a blog post about my visit to Animal Adventure Park last month. Many of you might have followed along last February and March as much of the world watched April the giraffe's pregnancy progress, and the birth of little Tajiri. I certainly got caught up in it, in part because the park is practically in my friend Robin's back yard in Harpursville, NY, less than an hour from where I live. Me and April the Giraffe! Can you tell I was happy to be there? It was a terrific day, spent in terrific company, and I'm already looking forward to going back next year. I looked at the calendar and suddenly realized it is SEPTEMBER. (Seriously, how the heck did that happen?) 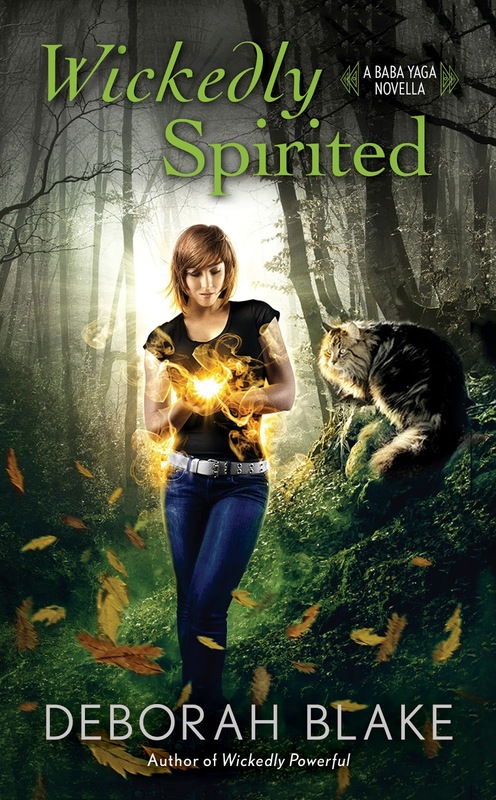 And that means that the next Baba Yaga novella, Wickedly Spirited, is coming out in less than three weeks! I had so much fun writing Jazz's story--she is, as the title says, spirited, and a completely unconventional Baba Yaga in training. And the novella features Bella's Chudo Yudo, Koshka, the dragon who is disguised as a giant Norwegian Forest cat. So obviously, this giveaway had to include a stuffed cat. Plus a signed copy of WICKEDLY POWERFUL, in case for some bizarre reason you haven't read it yet. And a broom pen, just because. As always, all you have to do to enter is fill in the Rafflecopter form (and you can take credit for following me on Twitter and things like that if you've already done them). Of course, I hope that you will order the novella, because, really, Magic likes to eat. But also, because this is probably the last Baba Yaga novella, so you know you want to. And as always, I really appreciate you spreading the word!